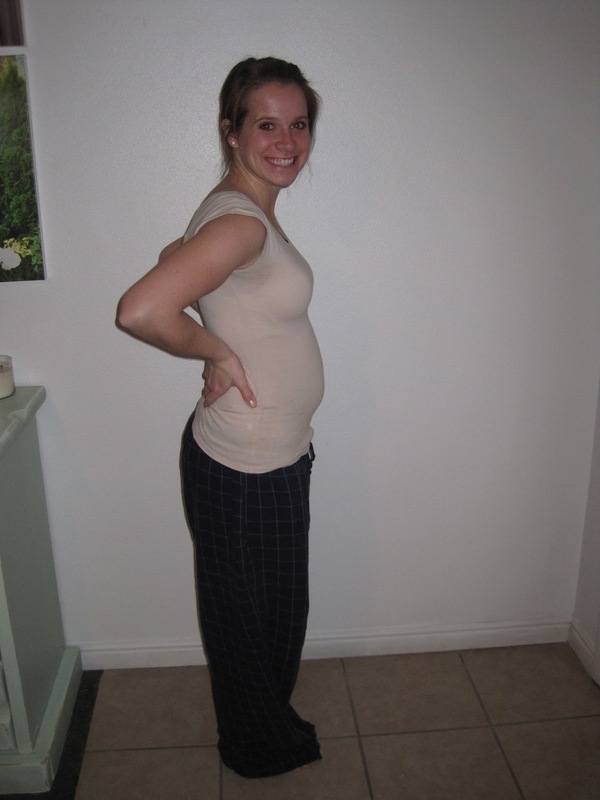 I wrote about my pregnancy with Jack all the time. So far I have been really slacking this time around. But Baby #2 will be sad if he/she looks back at our family blog journals and there is nothing about my pregnancy with him/her! So I figured I'd better get on it. I've been really bad at that, too. But I did take one at 11 weeks. One thing I've been really nervous about this time around is the weight gain. I gained 43 pounds with Jack and was seriously huge everywhere. This time I set a goal for myself of no more than 28 pounds. My Dr this time around wants me to stay under 30. I'd say so far, so good! Maybe this also means baby #2 won't be quite as huge as Jack? Okay so here's our story of early pregnancy with baby #2. Years before we ever had babies I told T I wanted to just have them bam, bam, bam. So we agreed that after baby #1 we just wouldn't go back on birth control. After I delivered Jack I changed my mind. "I am NOT doing that again any time soon." So I got the mini-pill. Fast forward 3 months and suddenly delivering another baby didn't seem so bad. I guess what they say about your memory fading is sort of true. Anyway, because we were still house-hunting and living with my parents, T wanted to wait on baby #2. He promised that once we closed on a house we could start trying. Fast forward a few months. We had a house under contract, waiting for closing. A month before the closing date I realized I had run out of birth control...on accident. No seriously, it really was on accident. I had thought I needed to order some, checked to be sure, and saw an extra pack sitting in the nightstand. Realized when I went to get it a few weeks later that it was actually Jack's Albuterol which comes in a package that, coincidentally, looks exactly like my birth control package. Well the way my insurance works is you have to mail order any prescription you take regularly. It takes a few weeks to arrive after you order it. Since we were going to start trying in a month anyway there was no point in ordering a new pack. So. I guess we unofficially started trying. I told T that the chances we'd get pregnant the first month like we did with Jack were pretty slim. I knew my period was late the week before we moved into the house but also knew I had a pregnancy test packed away somewhere. Even though it was just a dollar store test I didn't feel like getting another one when I already had one. So I waited until moving day. Unpacked the test. Took it. Positive. I was shocked to the very core. I kept saying "what the heck?" Even though I was a week late I really thought my cycle was still off from nursing. At this point I was still nursing 3x a day and really didn't think I would get pregnant so easily. So I was surprised but happily surprised. I really wanted Jack and baby to be close. Baby is due January 19 so they will be a little shy of 18 months apart. So far, this pregnancy is eerily similar to my pregnancy with Jack. No morning sickness in the first trimester [score!]. No symptoms except for having to pee all the time. Seriously, not even sore breasts. At all. Aaaand even down to having a UTI in early pregnancy both times. Wow. These kids are definitely siblings. Okay, I think I'm done boring you.